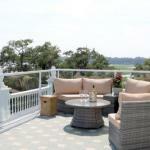 Anchorage 1770 in Beaufort provides accommodation with free bikes a garden and a terrace. Among the various facilities of this property are a shared lounge and a bar. The property features a restaurant. Guests at the inn can enjoy a Full English/Irish or an American breakfast. Hilton Head Island is 25 km from Anchorage 1770. The nearest airport is Savannah / Hilton Head Airport 60 km from the property.